Update 8.3 has arrived, and with it comes the long-awaited Chinese fleet! Let’s find out what’s in the garage waiting to roll out! The Chinese tank engineers developed their own unique designs by combining the best qualities of existing designs from foreign nations, whilst modernising and upgrading their technology to build the fiercest tanks of their time. As a result the Chinese tank fleet features the best possible traits from their foreign counterparts: the manoeuvrability of the American tanks, the shooting accuracy of the Brits, the fast firing of the French and the fire power of the Soviets. The new Chinese tech tree, containing 17 armoured vehicles, reflects this approach to the adaptation and modernisation of other nations’ armoured vehicles. The first group consists of imported vehicles. This group includes tanks that were bought or received from allies, or were captured on the battlefield. In other words, these are tanks that were not built in China. This group includes most of the first seven tiers. The names of these tanks include or even simply copy the names of the original vehicles. The second group embraces prototype vehicles. You will easily recognise tanks from this group as their names are made of numbers. In the third group are tanks that were created for governmental tests. The names of these vehicles include the letters “WZ” added to the front of their numerical names. Ultimately, only the Type 59 (WZ-120), the Type 58 and the Type 97 Chi-Ha entered service in the Chinese army. 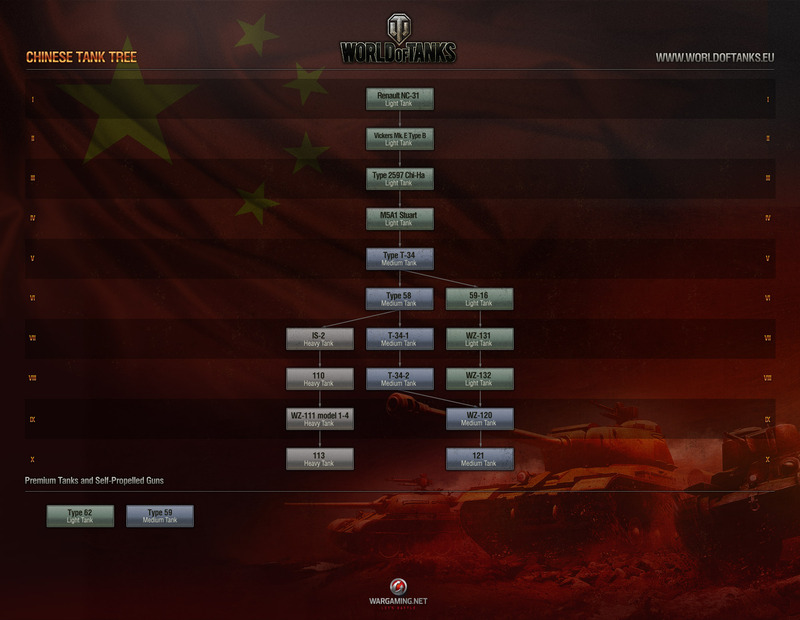 The firepower of Chinese tanks varies widely. This means that these vehicles, in combination with their excellent mobility, can undertake a wide variety of roles on the battlefield. One of the main features of the Chinese tank tree is that it has light tanks going up to Tier VIII making them quite important on the battlefield as excellent scouts. Similar combat vehicles have been in the game for a while (e. g. French tier VIII light tank AMX 13 90), but unlike those, the Chinese light tanks don’t have an automatic loader system. The main features of the Chinese medium tanks are guns capable of inflicting substantial damage and turrets that have awesome ricochet characteristics and great armour. (Renault NC-31, VAE Type B, M5A1 Stuart) 59-16, WZ131, WZ-132. Are you ready to roll with the Chinese? The upcoming Tank of the Month will be one of our new Chinese vehicles – the WZ-131. This is a domestic production model, and throughout February it will come with the usual bonus on credits. Be ready to level up! Clan Wars will be unavailable until 17th January at 03:15 CET (02:15 GMT).